God, I used to love these things. Luden's was a candy you could get away with eating in school because they masquerade as "throat drops". I loved the way they tasted like two at a time and the Luden's logo felt great when you scratched it against the roof of your mouth. Back in the day though they had the long bearded Luden's guy on the box. They've since changed that. The Luden's brand was originally created by William H. Luden (the long bearded Luden's guy) in 1879. Luden was the developer of the first menthol cough drop. He launched a backroom candy business in the rear of his father's jewelry shop in Reading, Pennsylvania. His "factory" was his family's 30 square foot kitchen. An early product was "moshie," a Pennsylvania Dutch candy made with brown sugar and molasses. 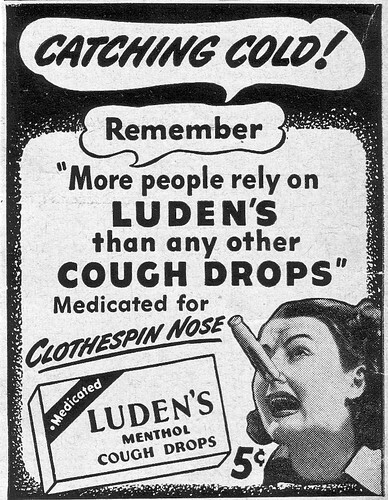 Luden later collaborated with a pharmacist to develop a cough drop formula. He coloured his cough drops amber instead of the red associated with cough drops at the time and in 1881 Luden's honey-licorice menthol throat drops were introduced. "Luden's Menthol Cough Drops" were sold for many years in 5-cent packages. Luden introduced new packaging methods as well, lining boxes with wax paper to extend shelf life. By1882 Luden's line included cough drops, hard and soft candies, chocolates and marshmallow products. Luden manufactured his own chocolate for his candies unlike many confectioners of the time. William Luden retired in 1927 just in time for the company to be bought out by Food Industries of Philadelphia, a holding company owned by the Dietrich family and since then the brand has been tossed around like a hot potato being sold from company to company. Most recently Luden’s was sold to Hershey's in 1986. Then Hershey's sold the brand to Pharmacia in 2001 but in 2003, Pharmacia was bought out by Pfizer and then in 2006, Pfizer sold Luden's to Johnson & Johnson. I need a nap. But during their heyday Luden’s produced a variety of candy confections in addition to its better-known cough drops. Luden's made the the 5th Avenue candy bar, which Hershey still produces today. It was first introduced 1936. The only person I ever knew who ate, and preferred, Fifth Avenue candy bars was my grandfather from the Bronx. The only thing "medicinal" about Luden's was the demulcent. Demulcent, derived from the Latin demuclere meaning "caress", is an agent that forms a soothing film over a mucus membrane (nostrils, lips, ears, assholes) relieving minor pain and inflammation of the membrane. Demulcents such as pectin, glycerin, honey and syrup are common ingredients in cough mixtures. These demulcents will coat the throat and relieve the irritation causing the cough. Marshmallows, oatmeal, plantains, flaxseed and liquorice are all common herbal demulcents. William Luden, aged 90, died in 1949 of a heart attack in Atlantic City. Great account of Ludens. Thank you. I searched all over the web to find out about it, as it came up in a listserve discussion about the concept Homo Ludens, the latter being the gerund from the Latin verb ludere to play. And other than Hershey, it was hard to find anyone who claimed to have made them. Now, thanks to you, I know all about it. And, curiously enough, 5th Avenue was one of my favorite candies as a youth in the Fifties. Thanks, I was doing research for my epic--I needed a metaphor. luden's lozenges did nicely. I ues to work there from june 1984 to jan 88. I loved that job, I made jelly eggs by hand. Worked in the starch room., hollow chocolate. Cherry line. Hershey wanted to destroy the company. Too much compitetiion. I waz a kid in a candy factory .it was old large spooky even. Old wooden floors ,old lighting .steam heated. Tons of sugar a day. Id use a full skid of fruit and fine sugar in 10 hours. It was the pride of Reading. Now the pride is section 8 wealfare. Mostly spanish stores, were bars and hotels were on every corner. 88 was the end ,union did the same thing to twinkies 30 years later. I spent the last 25 years in a copper mill. I miss that job. The people. The smells. And after 30 years im not any richer im just a slave laborer for uncle sams plantation. Now the whole city is gone. Was #1 place for crime in the U.S. Now the I lead school for bad kids and some other nonsense is there...the original building was taking down in 1990 ish.... If I hit the lotto I would rebuild it back .